Although alligators are close relatives of crocodiles, they differ by their rounded snouts and the kinds of environment they can live in. Alligators can survive in relatively cold climates, whereas crocodiles live only in tropical and subtropical regions. Actually, just two species of alligators exist: American alligators and Chinese alligators. These two species live in the wild on two continents: North America and Asia. 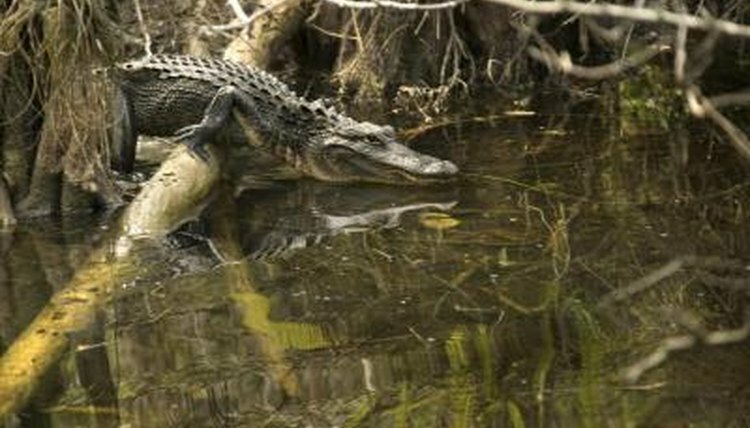 Only found in North America, American alligators inhabit coastal regions from North Carolina to Florida on the Atlantic coast, as well as along the Gulf coast into Texas. While they live in coastal areas, they're primarily freshwater creatures and don't actually venture into the ocean, although they sometimes live in brackish waters. They can be found in streams, rivers, swamps, lakes and ponds. Young alligators occasionally live in seasonal wetlands, including the Carolina Bays. Measuring in between roughly 9 3/4 and 14 3/4 feet, American alligators are the larger of the two alligator species. On average, these creatures live for 35 to 50 years in the wild, although they may occasionally live longer, as captive specimens have made it up to 80 years of age. Members of this species breed once a year, as soon as they've reached sexual maturity -- usually at around 10 to 12 years old. Males provide no parental care for the young, but mothers look after their babies for the first year of their lives. Chinese alligators have a very small geographical range, which has decreased by 90 percent over the last 20 years. They're only found in China, on the central Pacific coast, in the lower Yangtze River basin. This is a temperate, subtropical area. They live in ponds, lakes, wetlands, swamps, streams and rivers. Although they spend much of their time in the water, they also make burrows in banks of rivers and wetlands to which they will sometimes retreat. Primarily as a result of hunting by humans and loss of habitat, Chinese alligators are noted as "critically endangered" on the International Union for Conservation of Nature's red list. Just 150 of these creatures are thought to exist in the wild. They have a generally docile temperament -- there have been no reported attacks on humans by this species. Between late fall and early spring, when the temperature is cooler, they lay dormant in their burrows, only emerging in April when the weather is warmer. Are Bullfrogs an Endangered Species?